At Landau Pool Construction we transform pools, spas, and landscapes into a piece of art and create ultimate backyard experiences. Pool fire features have become the hottest trend in pool design. The use of fire in and around a swimming pool presents a striking visual as the flames reflect on the surface of the water. Fire can be added for both function and ambiance. From glowing fire bowls to fire pits and fireplaces the Landau staff are experts in creating an amazing, beautiful and warm atmosphere. Fire bowls and fire pits are ideal features to let you enjoy your backyard on cool fall nights. Whether employing a more natural look, surrounded with stone or even incorporated right into the pool environment, Landau can design an innovative fire pit and or fire bowl to make your backyard unique and stand apart from the norm. Landau also erects innovative and stunning outdoor fireplaces. 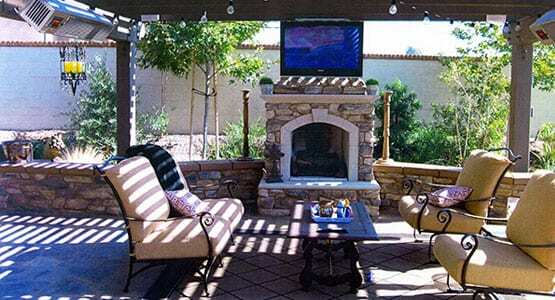 For the complete backyard “living room”, an outdoor fireplace can add that special finishing touch. Whether gas log or traditional, our fireplaces are built with the finest quality of materials for a high-end look that brings the inside comfortable feel of your home right outside.